Posture refers to the way that you hold your body when sitting, standing, lying down, lifting, bending, pulling, or reaching. 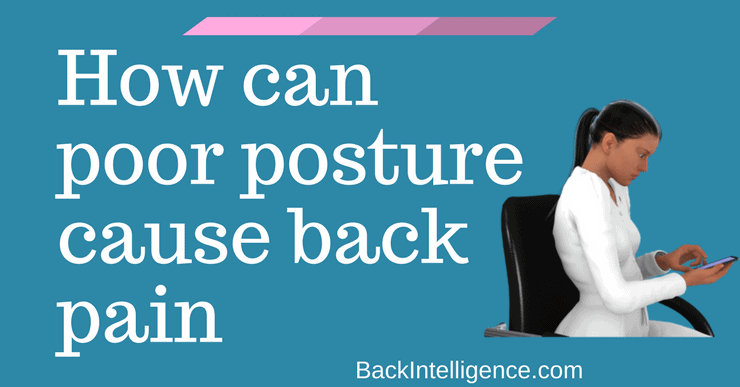 While you may think that achieving poor posture is impossible, by being aware of your daily postural habits can make a huge difference in the right direction. Your body is designed to be moving, but the reality is that many Americans spend far too much time sitting each day. Recent research suggests that the average adult in the United States sits for an average of 9 to 10 hours per day – this equates to 65% of your waking hours spent in a sedentary position! 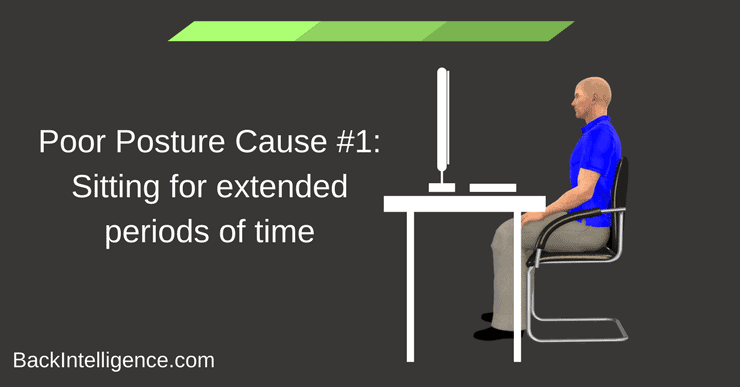 Sitting for extended periods of time results in poor posture that can result in back pain. When you’re sitting, your intrinsic and extrinsic back muscles, and your abdominal muscles, are no longer working to support your lower back. Poor lumbar support while you are seated results in a loss of your normal lumbar lordosis (normal curve of your lower back) and your upper body exerts pressure on the intervertebral discs of your lower back while they are in this compromised and unsupported position. ● Prolonged sitting causes the intrinsic and extrinsic muscles to become weaker and overstretched which can lead to muscle fatigue, stiffness and pain. ● Shortened hip flexors become a major issue, in particular the psoas muscles, with extended sitting and a tight psoas muscle is a known risk factor for lower back pain. ● The weight of the upper body on the intervertebral discs of the lower back, while they are unsupported, causes an uneven distribution of weight leaving you at risk of disc bulging. ● Lastly, siting position can interfere with circulation of blood to the lower body which decreases the amount of oxygen being delivered to the muscle and nerve cells in your back. 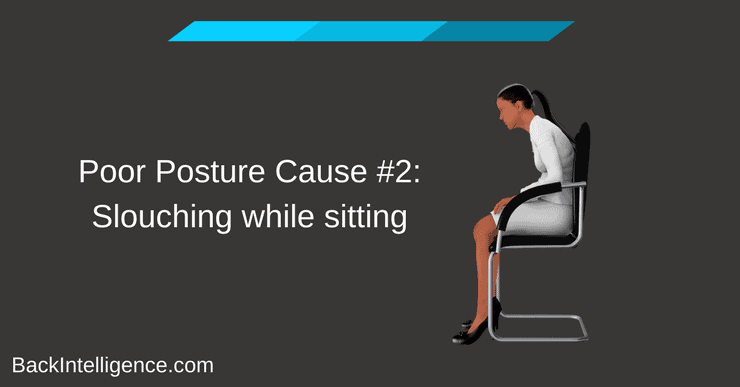 Let’s face it, most of us don’t sit properly and tend to slouch when seated. This puts an already unsupported lower back in an even more harmful position that can lead to back pain. According to a 2004 study, published in Clinical Biomechanics, slouching results in a backwards rotation of the sacrum with respect to the ilium, resulting in a posterior pelvic tilt. Take into account your arms and hands resting on a table, keyboard or steering wheel and your upper body relaxes even more. This exaggerated relaxing increases the weight of your upper body on your already unsupported lower back and the natural lumbar “s” shaped curve turns into a “C” shaped curve. ● The backwards rotation of the pelvis and flexion of the spine resulting from the slouching posture, results in a dorsal widening of the intervertebral disc at the L5-S1 level and places strain on the iliolumbar ligaments, resulting in low back pain. 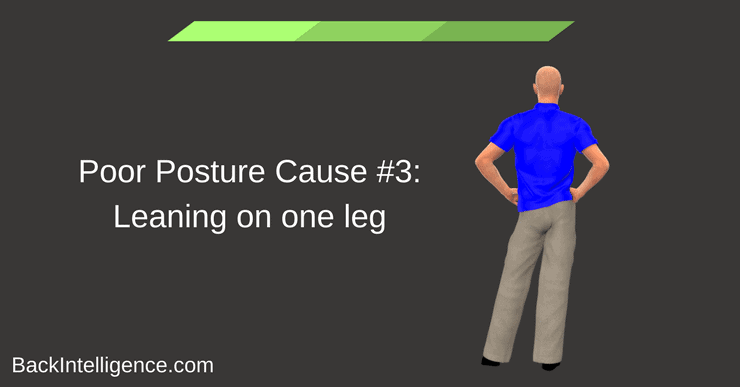 Leaning on one leg while standing, especially for lengthy periods of time, can be comfortable and you may not even be aware that you’re standing like this that this, but the issues that can result from this position are dramatic, so it’s important that you’re aware of your standing position. 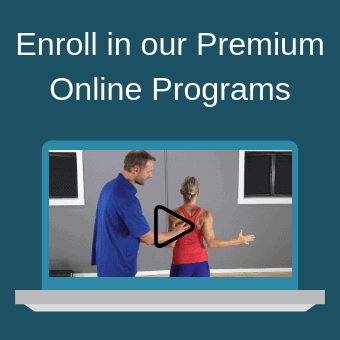 Let’s say you’re leaning on your right leg – this forces your right hip out and as this hip drops your pelvis will also start to tip to the right, leading to a cascade of events for your spine – your spine will also start to twist to the right, your right shoulder will drop, resulting in a rotation of this area, and your neck will also shift in an effort to compensate to keep your eye level horizontal. ● Rather than your buttocks and core muscles maintaining a neutral standing position, this position places excessive pressure on one hip, which causes your abductor to overwork and your gluteal muscles to weaken. ● Overtime, you may start to develop muscle imbalances of the pelvis, which can result in muscle strain and pain in the lower back, hip and buttocks. ● This position also puts strain on your neck and shoulder due to the compensating effects of the spine to maintain balance, resulting in neck and shoulder pain. It’s crazy to think that using your cell phone can have a significant impact on neck pain, but it can. 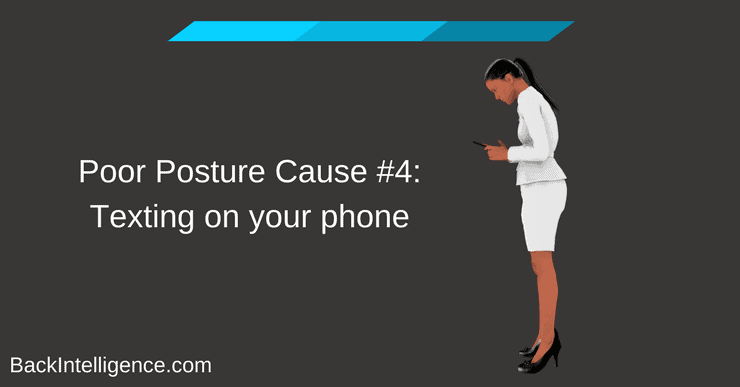 Constantly dropping your head to look down at your cell phone leads to a forward flexed neck position in most individuals. In fact, a 2012 study found that over 90% of participants had a forward flexed neck while texting on their cell phone. 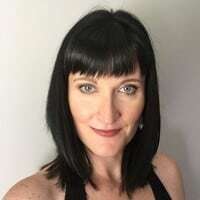 Other changes to your posture when this happens include your shoulders either lift upwards to your ears or your shoulders roll forward and the muscles of your neck and shoulder go into spasm. ● This forward neck position, drops your head forward which can add an extra 30 pounds of weight on the vertebra and also strains the trapezius, which can change the natural curvature of your spine. ● Further, this position leads to excessive strain on the muscles of your neck and can result in wear and tear on the structures of your neck, and a significant amount of pain too. 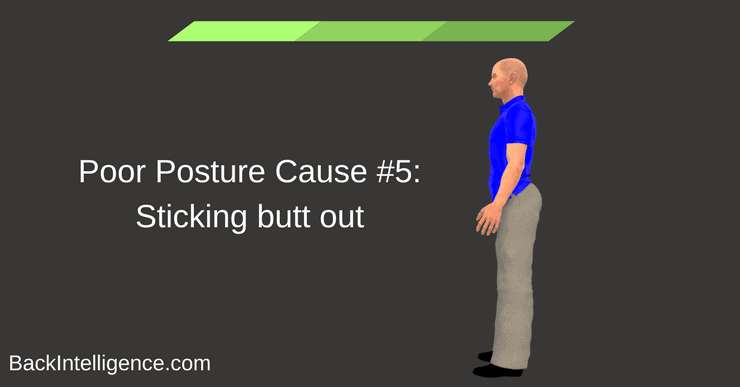 You might be unaware that you stand with your buttocks outwards unless someone points it out to you or you start to suffer with back pain. If you notice that you tend to stand with your buttocks outwards or that you have a pronounced curvature in your lower back, you likely have what’s called a hyperlordosis. This means that the normal curve is your lower back is exaggerated, creating what looks like a “Donald Duck” posture. 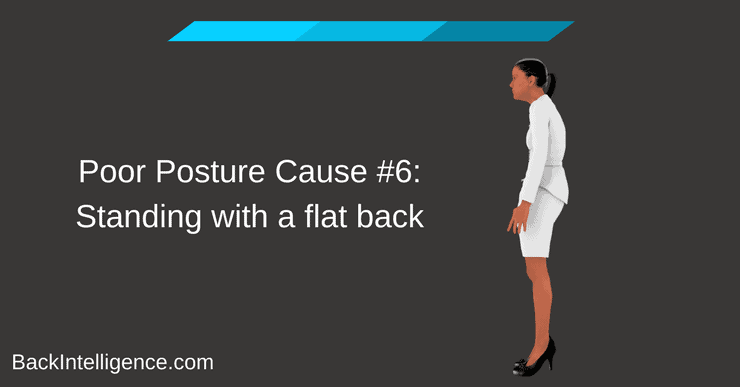 Certain things such as carrying extra weight around your stomach, pregnancy, and wearing high heels can result in this posture. ● An increase in a lordotic curve proportionally increases shearing stress or strain in the anterior direction resulting in your center of gravity shifting anteriorly. This increased lordosis is associated with an increased prevalence of low back pain. ● The lower back pain may not be directly attributable to the increased lordosis but rather the factors that contribute to this increase in lordosis including weakness of the trunk muscles, shortness of the back muscles, and weakness of the quadriceps and hamstrings. If you have a flat back, chances are you’ll be aware of it as you’ll be in a stooped position and have difficulty standing upright. In this position your pelvis is tucked in, which results in a loss of the natural lumbar lordosis, resulting in an imbalance of the spine. This position can also cause issues in other areas of the body, making you lean your head and neck forwards, and you may even have difficulty standing upright because your center is no longer centered over your pelvis and legs. ● In the case of flat back, the muscles of the lower back, buttocks and posterior thigh are recruited to tilt the pelvis to try and bring the body back into alignment. Due to the increased demands of these muscles, they commonly become fatigued, resulting in aches and pain. ● Additionally, hip and knee flexion during standing and walking is another way that patients with flat back compensate for the loss of normal lordosis, which can lead to a hip flexion contracture, resulting in shortening of the muscle in front of the hip. ● Over time, the imbalances that result from this posture, combined with the misalignment of the spine, can result in muscle fatigue and pain in the neck, upper back, lower back and even the legs. 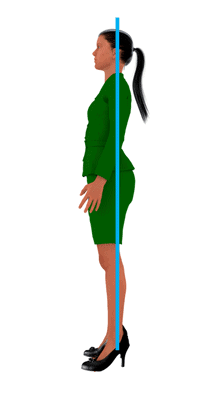 If you’ve ever looked at a picture of yourself from the side, and have noticed that your hips are pushed forwards and your upper back is swayed backwards you may have sway back posture. The body adapts to sway back posture in a variety of ways. With this type of posture, your pelvis shifts in front of your normal center of gravity, leading to a series of events for the rest of your body. Your hips will also push forward, causing them to be in a hyperextended position, which can overstretch the quadriceps and psoas muscles. The abnormal shift of these structures from their “normal” alignment results in hyperextension of the knees. Another typical characteristic that you see with this type of posture, is a backwards movement of the upper back (thoracic spine). This area of the spine tends to elongate and the chest tends to sink, resulting in an increased thoracic kyphosis. In turn, your chin will poke forward to compensate for this postural deviation. 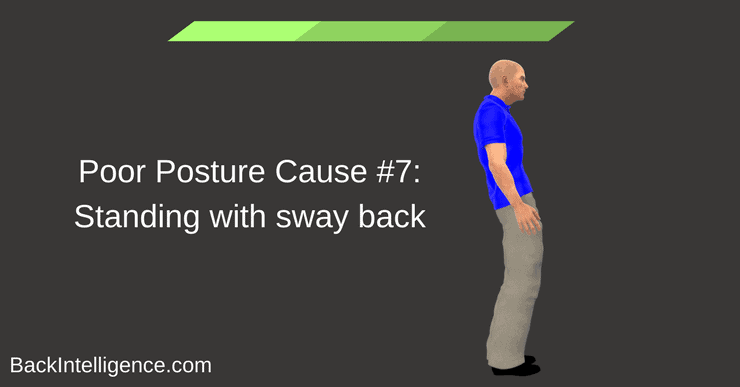 ● Sway back posture leads to a stiff, long thoracic curve and an increased lumbar lordosis. This abnormal positioning result in more pressure being exerted on the on the spinal joints and intervertebral discs in your lower back, which can lead to significant pain, especially if you stand for prolonged periods of time.